Thanks to Bell parents for the great questions! Where can I find the program flyer? 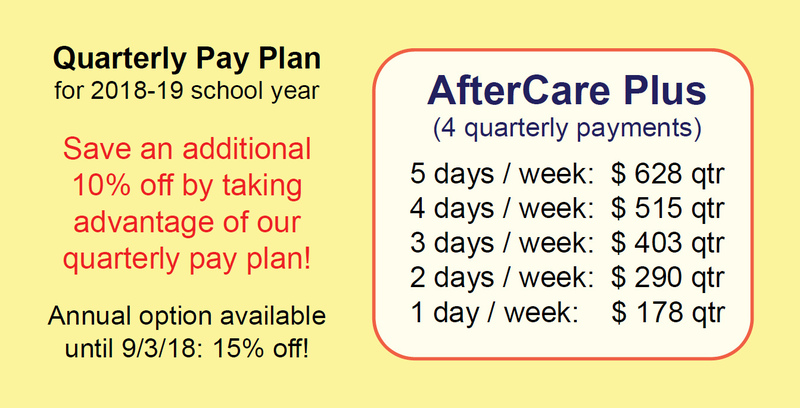 Does AfterCare Plus pricing include both aftercare and enrichment? Is your program open to middle school students? Where can I find pricing for AfterCare Plus? Can I change the attendance days, or the number of days each week? Where will you be located at Bell? Q. Where can I find the program flyer? A. Yes, we do! Our system will now automatically detect when you have paid for a second child's enrollment, and it will schedule a promotional discount for both registrations. For the automatic discount to apply, each registration should be for 2 or more quarters, or 3 or more months. If you selected a monthly registration period, the discount will be applied to the 3rd monthly payment. For quarterly registrations, the discount will be applied to the 2nd quarterly payment. The discount amount per registration depends on the number of days your child is registered for. For full week registrations, the discount is $50.00 per child. If you want to pay annually or have special circumstances, please let us know by calling us at 773-761-KIDS or by using our secure online contact form. We want to be a partner in your child's education, and we will help however we can. Q. Does AfterCare Plus pricing include both aftercare and enrichment? Q. Is your program open to middle school students? A. Yes, AfterCare Plus is a great destination for middle school students! We have some engaging activities planned for the older kids, and the school has allocated us additional space for quiet, supported homework and study time. Q. Where can I find pricing for AfterCare Plus? Q. Can I change the attendance days, or the number of days each week? A. You can increase the number of attendance days at any time. Initially, this will need to be done by phone or through our secure online contact form while we update our website with the appropriate functionality. You may also change days of the week at any time. For example, if your child is registered for M W F and needs to change to M Th F, that works for us, but will again need to be done by phone until we integrate this into our website. 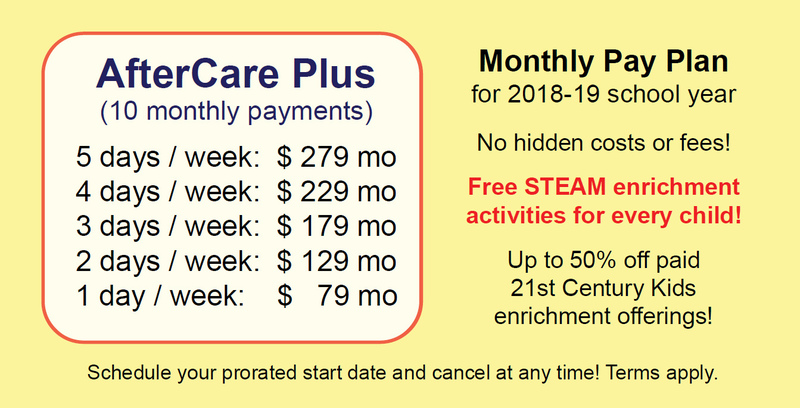 Parents can cancel AfterCare Plus at any time and not be billed further, so a reduction in days can be done at the end of their current term (month or quarter, depending on what the child is registered for). This is because we must allocate resources (staff, hands-on project materials, etc.) based on projected enrollment, and these costs can get expensive. However, we are seeking feedback from parents, and may change this policy at some time in the future. Your input would be appreciated as we further develop the AfterCare Plus program. Q. Where will you be located at Bell? A. Our staff office will be next to the security desk at Bell's main entrance. We will monitor the main entrance doors after 5:30pm, and our staff members will be immediately accessible to parents by phone and text through a single number. Q. Is AfterCare Plus hiring? A. Yes, we are! Please click here for more infromation.